If you're in the market for a hardy, drought-tolerant, low-maintenance bloomer, ranunculus, or Persian buttercup, will fill the bill nicely. Ranunculus, available in a rainbow of bright colors, will bloom profusely all summer long with little else but plenty of bright sunshine. The blooms, which rise above lacy green foliage, make great, long-lasting cut flowers. Ranunculus, a low grower, is terrific for border planting or in containers. Plant ranunculus bulbs in autumn for spring and summer blooming. 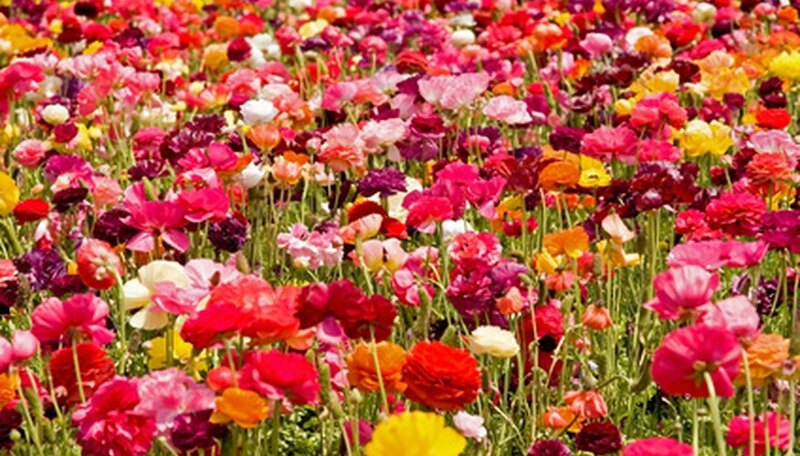 Purchase ranunculus bulbs at a greenhouse or garden store. Choose firm bulbs with no bruises or blemishes. Choose a sunny spot for the ranunculus and use a hoe or tiller to cultivate the soil to 8 to 10 inches. Be sure the soil drains well. If rainwater puddles for more than four or five hours, choose a better place or work 3 to 4 inches of organic material into the soil. Compost, peat moss, decomposed manure or ground bark will all improve drainage. Dig a hole 2 inches deep for each ranunculus bulb. The bulbs will look like a small bunch of dry, brown bananas, and should be planted with the bottom of the bulbs facing down. Allow 3 to 4 inches between each bulb. To plant ranunculus in containers, fill a container with commercial potting soil and plant the bulbs 2 inches deep. Put the container where the ranunculus will be in full sunlight. Water the area deeply. Roots will form soon after planting, and blooms will appear in late spring. After growth appears in spring, water the ranunculus when the soil is dry. Check containerized ranunculus often, as potting soil in containers drys out rapidly. Cut ranunculus blooms as often as desired for cut flower bouquets, as removing the blooms will encourage more prolific growth. Remove any spent blooms that remain on the plant. Dig the ranunculus bulbs and store them for the winter if you live where the winter temperatures drop below 5 degrees Fahrenheit. Use a garden fork to lift the bulbs from the ground after the foliage turns yellow in autumn. Discard any soft or blemished bulbs. Put the bulbs in a cool, dry place to dry for seven to 10 days, then store the bulbs in a cardboard box or paper bag filled with peat moss or sawdust. Store the bulbs so that they aren't touching. Leave the foliage in place when the ranunculus is done blooming in autumn, as the leaves will provide the bulbs with nourishment over the winter. When the foliage dies down and turns yellow, the foliage can safely be removed. Don't water the bulbs during the winter, which is their dormant period. The ranunculus will regrow in spring. Containerized ranunculus can remain in the pot. Place the pot in a cool, dry place until spring.